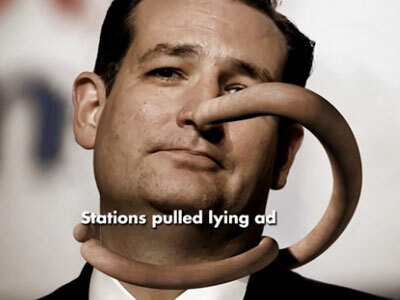 “Many just call him lyin’ Ted,” begins a campaign ad from pro-John Kasich Super PAC New Day for America. At this point it’s a typical attack ad setup: photo of Ted Cruz, some quoted onscreen text. Simple, as simple as Nose, the ad’s title. But then, Cruz’s nose begins to grow. Ok, you think to yourself, it’s a Pinocchio ad, also pretty normal. But then, the nose continues to grow, wrapping itself around the Cruz’s neck, again and again. It’s as if Disney’s vision was reinterpreted by the creators of the film Anaconda. Words continue to be spoken, but you hear nothing, transfixed by the growing coils around Ted Cruz’s neck.